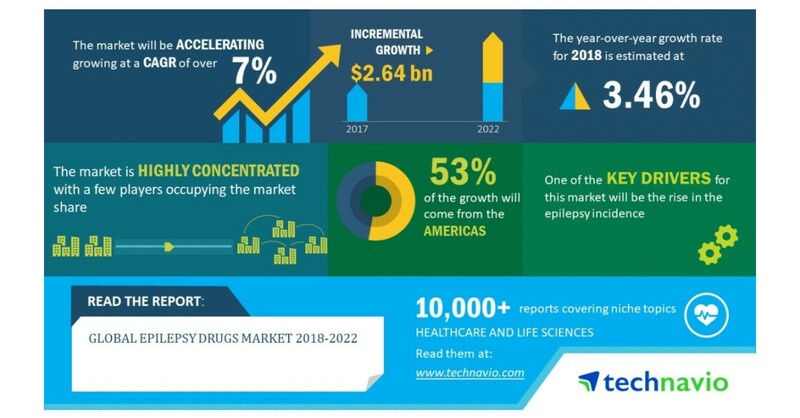 LONDON–(BUSINESS WIRE)–Technavio analysts forecast the global epilepsy drugs market to grow at a CAGR of over 7% during the forecast period, according to their latest market research report. The increase in epilepsy management costs is one of the major trends being witnessed in the global epilepsy drugs market 2018-2022. Direct costs associated with epilepsy are costs of hospitalization, outpatient treatment, anticonvulsants, diagnostic workup, rehabilitation, ancillary treatment, transportation, special equipment, nursing care, and parents’ co-payments. Indirect costs include the reduction of working hours, quitting work, and days off due to seizures. Epilepsy treatment is associated with high directs costs due to frequent inpatient admissions and high indirect costs due to productivity losses. The high variation in the prevalence and incidence of epilepsy globally can be attributed to the factors such as the difference in access to healthcare, regional environment exposures such as neurocysticercosis, and socioeconomic status in different countries. The global epilepsy drugs market research report provides market segmentation by drug activity spectrum (narrow spectrum drugs and broad-spectrum drugs) and by region (the Americas, EMEA, and APAC). It provides an in-depth analysis of the prominent factors influencing the market, including drivers, opportunities, trends, and industry-specific challenges. The Americas held the largest share of the market in 2017, accounting for close to 63% share, followed by EMEA and APAC respectively. The region dominates the market owing to the increase in epilepsy treatment due to the high incidence and prevalence of the disorder and advanced treatment options.